As a followup to TamilMurasu news, today’s issue of Dinamalar clarifies the stand from the newspaper as the complaints on its employees to be baseless. Check out Dinamalar Page 3 for the report and next to sports page for ‘Explanation’ on a bullet-points in edition dated 15th July, 2007. I think for millions of Dinamalar readers and fans like us, it is a great relief from the mental agony over the past three days because of this new problem shaking up Dinamalar. Dinamalar seems to have a chain of complaints on the complainant’s behavior since the time she joined the organization, not in good terms with other employees and left the organization without any notice. They also claim that she has taken the full settlement on 13.3.2007 and she got relieved. They accuse that she had earlier given a complaint on Abusive SMS on Mr. Arun, working with a private television channel to All woman Police station in Mambalam. On detailed inquiry, it was found to be false complaint. In the melee, Dinamalar staff kept recieving abusive calls since then. A woman used to talk very vulgar to them. Dinamalar had filed a complaint on her to Greater Chennai police and while CyberCrime Team was investigating they found that the woman was none other than Uma. Finding herself entrapped, she used the same ploy that she used on Arun for de-faming Ramesh (“Andhumani”) and quite interestingly she quoted the same mobile number that she mentioned in the report against Arun. With all these in place and Dinamalar also sending reports to other television channels, a few of the politically motivated television channels see this as a good booty-spree to defame Dinamalar and bring thier name into fame. Let us wait and see how Dinamalar proves thier innocence and comes out of this entangle. The security staff are intended to protect the assets. But there are unique incidents in Chennai when security staff itself resort to all types of thefts and burglary. To mention in a quick summary, there have been cases when ICICI Bank ATM Security in Pondy Bazaar ATM involves in a racket of theiving from customer’s account with the help of corrupt bank staff. We have been discussing sometime back about eve-teasing menace by security staff at Spencer’s Plaza. Just about a stone throw distance from there, we now have another theft incident at Higginbothams which is about 150 year old bookshop in Chennai. Higginbothams has been a significant landmark of Chennai. They now have even bookstalls in all railway stations too. 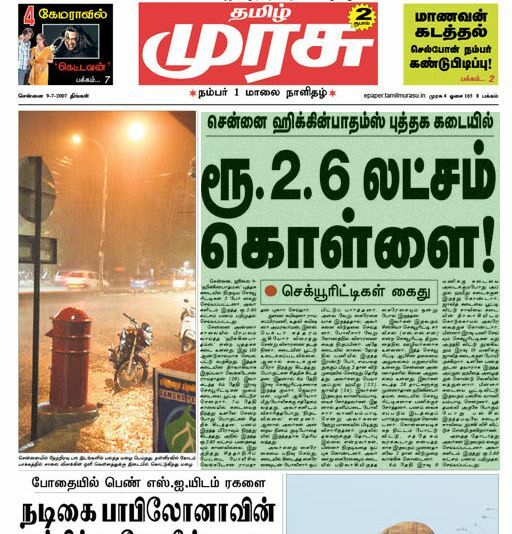 This news had been covered in Tamil Murasu, Chennai’s leading Tamil evening daily on 9th July, 2007 in its headlines. A screenshot has been attached for readers quick reference. A synopsis of the event is as follows. Two of the security personnel, hired from Sincere Security Services, Madurai have been observing the various cash procedures at Higginbothams. On the particular ill-fated day, when thier duty was only on day-time, one of them hides inside the stall. The employer asks the other person to lock the doors and deliver the key to his house. Now, the other two night security personnel go into thier inebriated state at 2200 hours. The theft-partner now goes into the stall, makes with the booty along with the person hiding inside. Their native is Vaniyambadi near Vellore. Hence they start off with the booty to thier native in bus. While the bus crosses Poonamalee (city outskirts), they throw off the keys from the bus. The incident comes to limelight the next day when the manager does not recieve the locked keys and also when the cash register theft is observed. Interestingly, the duo have applied for a two day leave to distract the cops from placing a suspicion on them.I think, it is high time for enterprises and residents of Chennai to be more watchful on the security they hire to protect thier assets even more than taking precaution on the real thief. We anyway know the ill-goals of the thief and hence we would act carefully however, since we hire the security and hence when they foul-play the trust bestowed on them, this assumes acute significance. Let us see, how Chennai Cops are going to bring discipline in this issue of security organizations. Following the trend of Chennai Cops involving in abusive, obscene SMS scam and harassment of women employee, it is now Dinamalar employee to enter the foray now. Ramesh, who writes in Dinamalar under the pen name of Andhumani one of the managing directors of Dinamalar, a leading Tamil newspaper, today finds himself gheroed by media reports from diversified quarters of harassing a woman reporter Uma even after she resigning from the services of the organization. You can find a complete coverage of the news in ‘Tamil Murasu‘ (July 14, 2007). A screenshot of the news has been attached here as a quick reference for the readers. 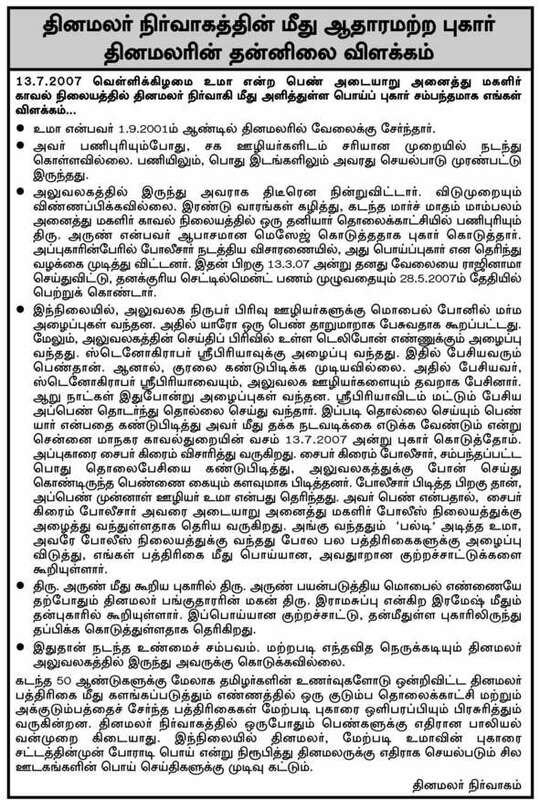 Andhumani columns are very famous in Dinamalar Varamalar editions every week. With so much of fans for me, it is indeed a rude shockwave that spreads across on the real color behind the guy who writes under the pen name of Varamalar. Note: Since Tamil Murasu comes from the rival house of Dinamalar, this news might also be a blatant political attempt of them to dissuade and shoo-shoo away the regular readers of Dinamalar. Dinamalar is known for a neutral news delivery, efficient news coverage without political bias unlike the former which has attachments to various political parties. Hence, let us have a watch on this and keep updating this post as investigation goes. Let us wait and watch what action Dinamalar management takes on thier erring employee and bring discipline among their cadre. This post would actually serve as an informative link on the various social concern moves and websites that have been launched by philanthropists worldwide to cure the maladies that are injuring the reputation of the country, to serve the citizens and to increase the image and prowess of our nation in the global ranking. India Eye Witness — A forum to demonstrate the various maladies in the country on different sectors along with readers suggestions to get redressal and to accomplish a cure of the same. Literal Meaning: The road was a dead end from T. Nagar with a compound wall and hence the vehicles have to turn towards Saidapet. So if you don’t stop then you run risk of hitting into the wall. Traffic Concern: With speeding vehicles on Anna Salai, the vehicles coming from T. Nagar are expected to Stop and Yield for vehicles plying straight on Anna Salai before joining the main traffic.